From time to time, weird Christian (Mormon, Jehovist, whatever) people stop me on the street and explain to me that God exists or - worse - that I need him. If this happens to you, the absolutely worst thing you can do is to point out inconsistencies in the Bible and try to prove that God does not exist. This is bad idea because Christians know Bible better than you and you cannot prove God does not exist when no one is even sure what the words "God exists" mean. The only correct way is to "put ball back into their court" and explain that you indeed believe in God. This will make them happy at first but then you drop the "bombshell" - the God you believe in is different than their God. It's best to use some kind of God which is not very well known to the Christians. Satan works really well if you explain that "your Satan" has nothing to do with "Satan" in the Bible (of course "Bible is pack of lies, created by the real Satan to confuse people" etc., etc...). When you use Satan, the discussion usually ends really quickly. If you have enough time, you can choose something more original. I sometimes used "Purple Gelatinous Cube" as my God (of course, nobody can prove that "Purple Gelationous Cube" did not create the universe). But now, I have new God: Flying Spaghetti Monster! Flying Spaghetti Monster consists of two eyes, two meatballs and spaghetti. 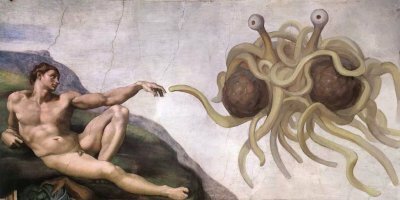 It created the whole universe, its followers are called The Pastafarians, dress as pirates (if possible) and their prayers are ended with "Ramen". In reality, it was created because of Evolution and Kansas School Board (if you are American, you probably know about it, if you are not, you probably wouldn't believe it) - you can read about it here and remember - this is not a joke or parody. This is really happening in the U.S.! Flying Spaghetti Monster's homepage is here. But God does not need homepage. If you let FSM enter your heart, you WILL KNOW THE TRUTH. Ask yourself: What is more believable? Flying spaghetti with eyes or God who is his own son and the dove at the same time? I cannot wait for my next encounter with a rabid Christian (Jehovist, Mormon, whatever). Arrrrrr, shiver my timbers!